Warming up your arms, sharpening your observation skills, and finding forms on paper through the use of line. By doing gesture drawings, we make use of an excellent way of gaining an understanding of birds and their forms. With gesture drawings, we are searching for the three-dimensional shapes of birds by making fluid marks on the paper. Without being overly concerned about details, our lines are brisk maps of the bird’s postures and attitudes. More importantly, gestures are a great way of warming up our arms and hand-eye coordination. They allow us to have fun with our work, learning to be less precious about our markings and open to possibilities and growth. Gestures give us the freedom to search and find the way for our lines. TOOLS: Just about any medium will do for drawing gestures, but self-contained tools such as a pencil or a pen are easier for beginners than paints. Consider using a graphite pencil, a felt-tip marker, a charcoal stick or a pastel. Use a drawing pad of a comfortable size – large enough for loose drawings and portable enough to be taken on every outing. SUBJECT: Take your drawing pad out everywhere you can. While your primary interest may be sketching birds, practice doing gesture drawings of animate and inanimate objects. 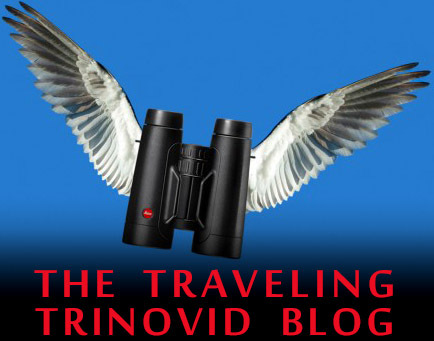 Take your pad out when you are birding – or when you are out in nature in general. Stop briefly to make gestures of every bird you see. Do quick sketches of leaves, mushrooms, rock formations, etc. Get into the habit! Gesture drawings of a Gray Catbird done with charcoal at Fort Zachary Taylor, Key West, Spring 2012. 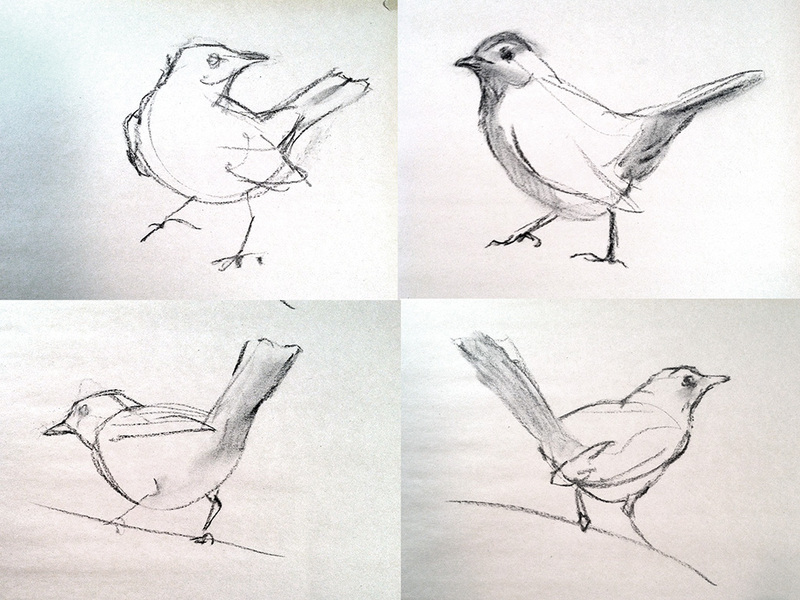 As the catbird foraged on the floor and changed positions, I made fast sketches of its various postures. These are only 4 out of many. Some are just a few lines, but I tried to address the entire bird in each, not being too concerned with details, but with portraying the action. Each drawing is roughly 7 inches in size, done on a large newsprint pad. Make your gestures loose and as large as space allows. Use your entire arm while drawing! Wrists alone have limited movement. Don’t spend much time on each gesture, a minute or two will do. Do several gestures one after the other. Spend as much time observing as you do sketching. What we are trying to capture with gesture drawings is the character of the bird, not necessarily its details. The character may be in its posture or behavior. Ask yourself these questions: How is your subject holding its head in relation to its body? Where is its center of gravity? Where are the legs in relation to its body? Is the body or head foreshortened? What is the tail doing? Always ask questions while gesturing, and look for the answers in brief strokes. Getting Ahead: Before you go out sketching birds in the field, familiarize yourself with the parts of birds, even if it is a general understanding. The more you know about bird topography, particularly the feather groupings, the better prepared you will be at drawing birds with accuracy. The following are illustrations included in my 2005 field guide to Raptors and Owls of Georgia (Buneba Print) – which includes all the then-known diurnal and nocturnal birds of prey found in the nation of the Caucasus Region. 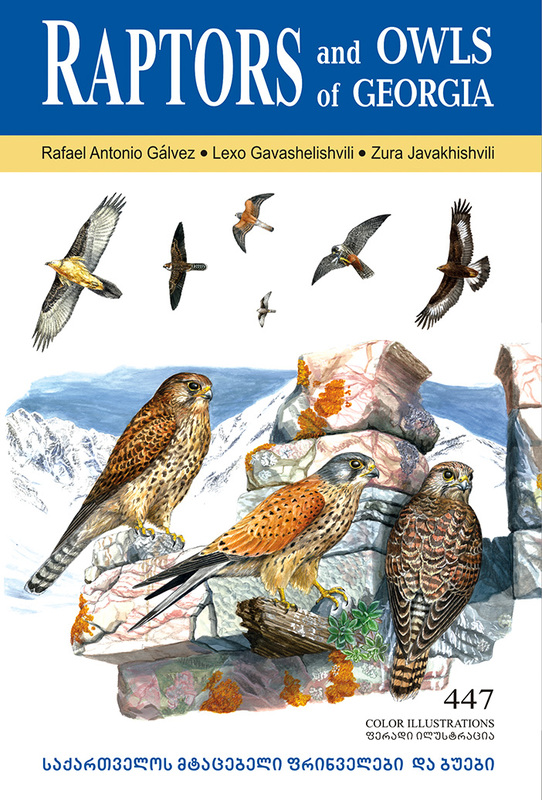 The book was produced in collaboration with the Georgian Center for the Conservation of Wildlife – a BirdLife International affiliate, and was coauthored by Lexo Gavashelishvili and Zura Javakhishvili. The gallery below also includes some of the sketches created in preparation for the guide during the fall of 2004. Only some of the book’s illustrations of vultures are shown here. The Cinereous Vulture (Aegypius monachus) depicted in juvenile plumage (top) and two adult variants. The Eurasian Griffon Vulture (Gyps fulvus) depicted in juvenile and adult plumages. An adult Lammergeier (Gypaetus barbatus). This “bearded vulture” acquires its orange coloration by wallowing in iron-rich springs and mud. Adult and juvenile Lammergeiers depicted in flight. Graphite and watercolor thumbnails included in the upper portion of the species’ plate, depicting some of the flight attitudes of this large vulture. Images included in the upper portion of the Egyptian Vulture plate, depicting four ages/plumages of the species. Raptors and Owls of Georgia was the first comprehensive field guide to the birds of prey recorded in this mountainous country, describing 45 species including breeding birds, seasonal residents, migrants, and uncommon visitors. The book is available for sale through the following distributors: NHBS (UK), Buteo Book (U.S.) and Amazon. 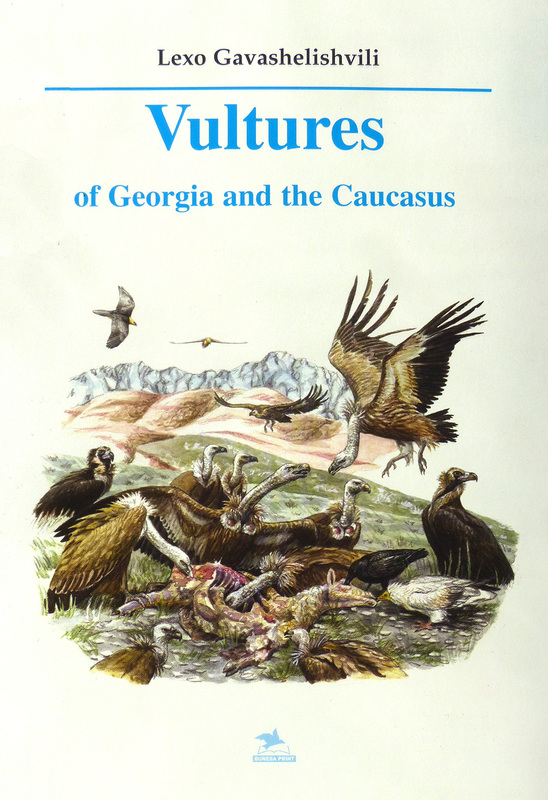 Some of these illustrations were also included in Lexo Gavashelishvili’s excellent book, Vultures of Georgia and the Caucasus (Buneba Print, 2005). While one could get into tedious preparations by buying materials and equipment before making the first marks, all one really needs is a regular old pencil and a pad to get started with field sketching. Don’t forget the importance of observation! Have lofty goals, but realistic expectations. If you are struggling with drawing the shape of a shorebird, you should remember that the answer to your frustrations is in the shorebird itself. 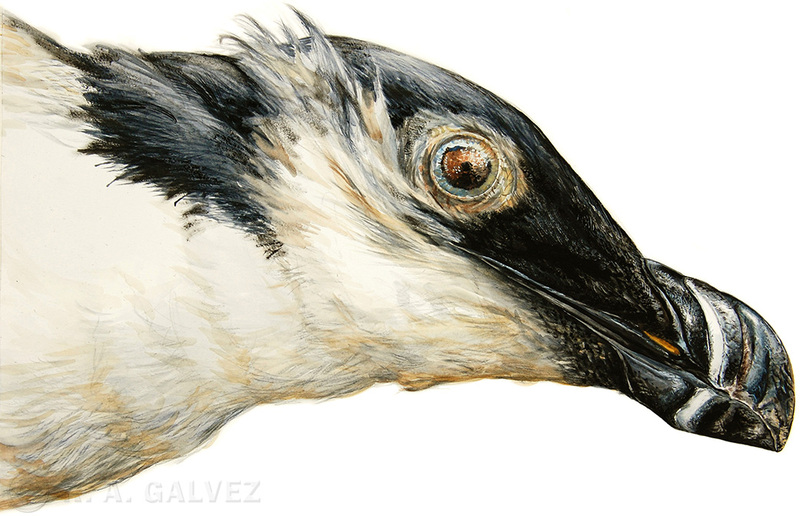 A fair dose of “observation” will give you the necessary information to draw the parts of the bird with more accuracy. If you are spending too much time drawing, and not enough time observing, chances are that you are making things up. You will likely never achieve the degree of desired accuracy in your renderings if you don’t spend plenty of time observing your subject. TRY THIS: Spend no more than 10 seconds sketching after 5 seconds of observation – and so on… Ideally, you want to spend as much time observing as you do sketching. While it may be relatively easy to pick up a pencil and draw a pleasant stylization of a bird, it takes plenty of practice to draw what we see in the field. Practice goes a long way! Warm up! In the same way we warm-up before exercising, do gesture drawings to loosen up your arms and hone in your observation skills before committing to longer renderings. TRY THIS: Don’t get too caught up in any one drawing, but do as many quick sketches as possible, aiming to capture different aspects of the bird in each. This sample of gesture drawings was done in a few minutes at an agricultural field near my house on an August afternoon. Some of the sketches are no more than a few lines, yet they address the general postures of the birds observed. With more time, I was able to add some pencil smudging to denote volume, and texture. Your goal may be to create epic paintings with multiple birds and habitat – but remember that it takes time and commitment to grow in this craft. You will also discover that each small step leads to greater accomplishments. Stick to it and you will get far. If you are just beginning, learn to take your work lightly at first. Laugh at mistakes – and make plenty because that is how we learn. TRY THIS: Make several sketches from observation, without using an eraser* to correct mistakes. Instead, redraw your lines until you find the right shapes. * Erasers are great tools, but they have their place and time. Don’t get too caught up erasing mistakes. To get started, all you really need is a pencil and a pad. See if you can first “capture the gestures” of birds, before getting into any kind of detail. Before setting out on epic sketching expeditions to your nearby preserve, practice on common birds in your backyard – practice gestures on your pet, on people, on inanimate objects, etc. TRY THIS: Keep a small pad handy at all times. Do quick gestures while stuck in a waiting room or when taking a break at work. Remember – these are just practice gestures, so it does not matter how “nice” they look. Move on! After you have considered these points, you may realize there is much more to this field sketching business. I am a strong proponent of sketching wildlife through the use of binoculars or a spotting scope – when advantageous. However, if you live near a natural site where birds are accustomed to human proximity, you may not need these tools. A simple and excellent opportunity may be practicing with feeder birds at your backyard. 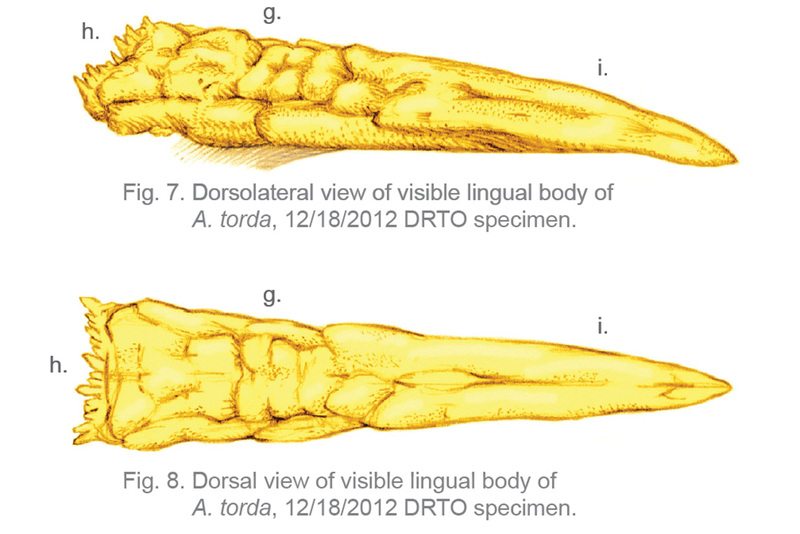 Rostrolateral view of an Alca torda bill and buccal organs, sketched from direct examination of a corpse found in Dry Tortugas National Park on 12/18/2012. CLICK IMAGE TO ENLARGE. During the winter of 2012-2013, hundreds of Razorbills were seen off the coasts of South Florida; an unprecedented event in recorded history. Most of the documented birds that engaged in this ‘invasion’ event appeared to be young or immature. The distinctive bill of the species has received significant attention in several studies, and has been suggested as an aid in determining the maturity of individual birds. 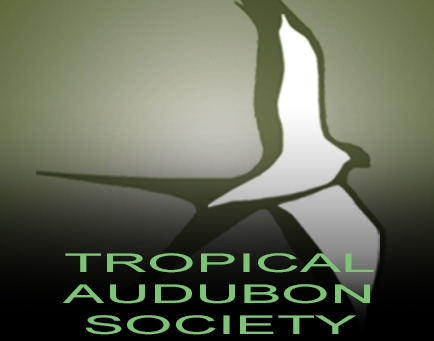 Considering the relative few adult individuals documented on Florida waters this winter, the finding of an adult Alca torda corpse in the Dry Tortugas (DRTO) during the Christmas Bird Count (113th) expedition offered a unique opportunity to closely examine a mature bill. 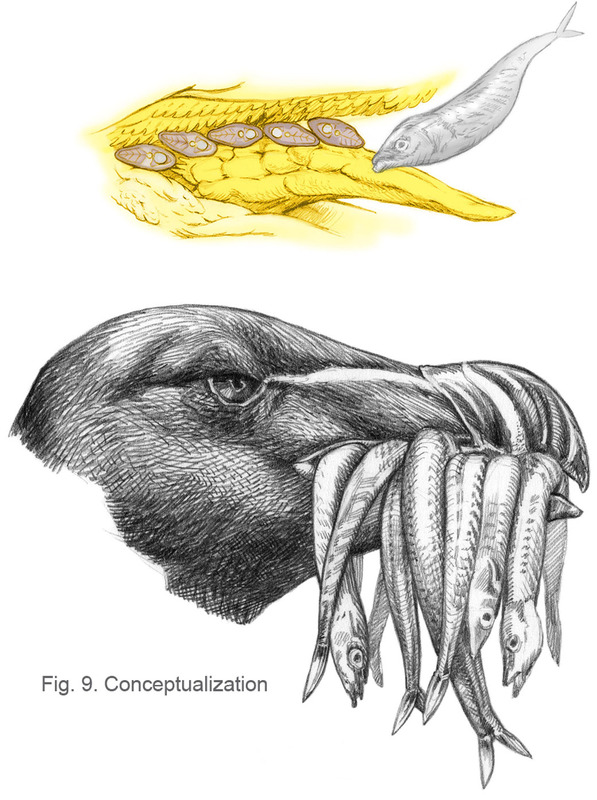 The fresh specimen also presented an opportunity to study the uncorrupted interior of the mouth and the buccal organs, which are adapted to catching and retaining fish prey and are bright yellow in adult birds. The bill of the Alca torda – or Razorbill – is perhaps the most distinctive physical trait of the species. 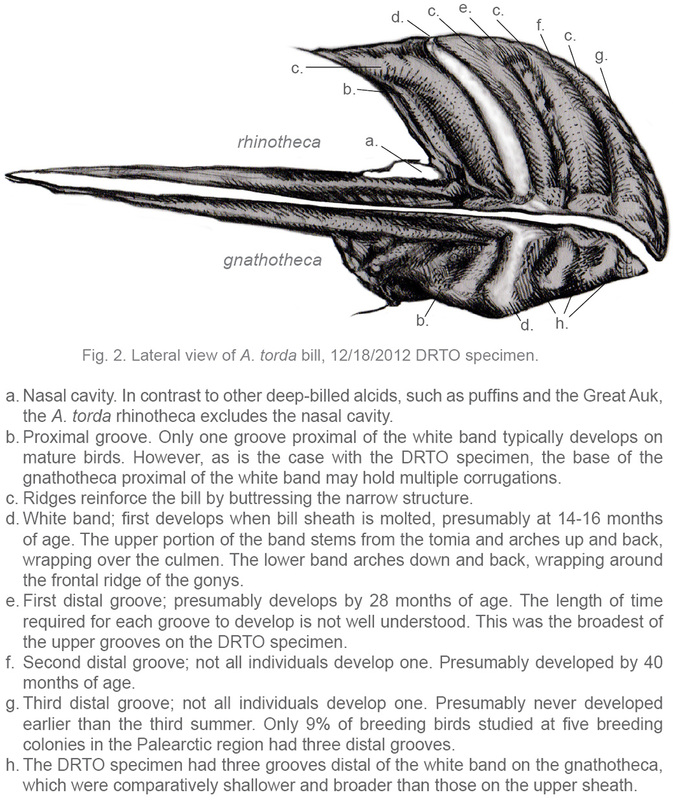 With maturity, the bill may grow to be a relatively large and laterally compressed organ with a steeply curved culmen and a complex sculpting of grooves and ridges. Birds develop an arching white “band” across the upper and lower mandibles as they age, and rarely two bands. The bill undergoes many stresses while foraging and during breeding disputes, and may develop a buttressed sculpt to reinforce the narrow organ. The mouth interior and tongue of adults are an intense warm yellow. These are used in breeding displays and to incite feeding behavior. By contrast, the bills of younger birds have flatter culmens, and may be entirely devoid of grooves. At all ages, the bill is primarily black and glossy, with a hooked tip and sharp distal tomia that flatten and broaden towards the gape. The interior of the juvenile mouth is pale yellow. Fig. 1. 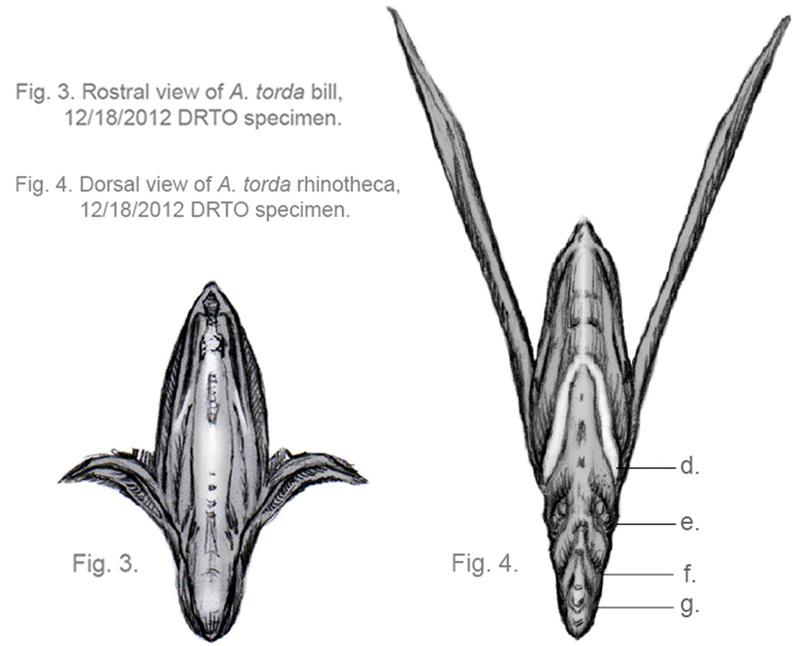 Lateral view of Alca torda bill, sketched from direct observation, DRTO 12/18/2012 specimen. CLICK IMAGE TO ENLARGE. After breeding, Razorbills will shed the outermost layer of the bill, reducing its overall size, and dulling its gloss and color. This shedding of the external sheath of the bill is true also of other alcids, particularly the puffins (Fratercula). With the arrival of the breeding season, an outer keratin layer develops; in the Alcidae this may be manifested in the form of plates, knobs or horny projections that serve as ornamentation for courtship purposes. In Razorbills, the sculpting of the bill’s grooves becomes pronounced, the ridges smoother and rounder, and the black darker and glossier, contrasting a whiter band when present. Studies at breeding colonies have explored the potential for aging individual Razorbills based on the number and characteristic of bill grooves (Jones 1988). However, the shape and sculpture of bills is variable individually, geographically and possibly even sexually in Razorbills. It is unclear how sexual maturity relates to bill development. Some Razorbills have been known to breed earlier in Nearctic colonies, compared to the Palearctic (Lavers et al. 2008). In general, the bill develops slowly in the species, and may continually become deeper and more grooved in some birds as they age. R. A. Galvez. Adapted from Jones 1988, Lloyd and Perrins 1977, Lavers et al. 2008. CLICK CHART TO ENLARGE. The distinctive white band across the bill does not generally begin developing until approximately 15 months of age, so it is unlikely that birds in their first winter show any sign of this trait. 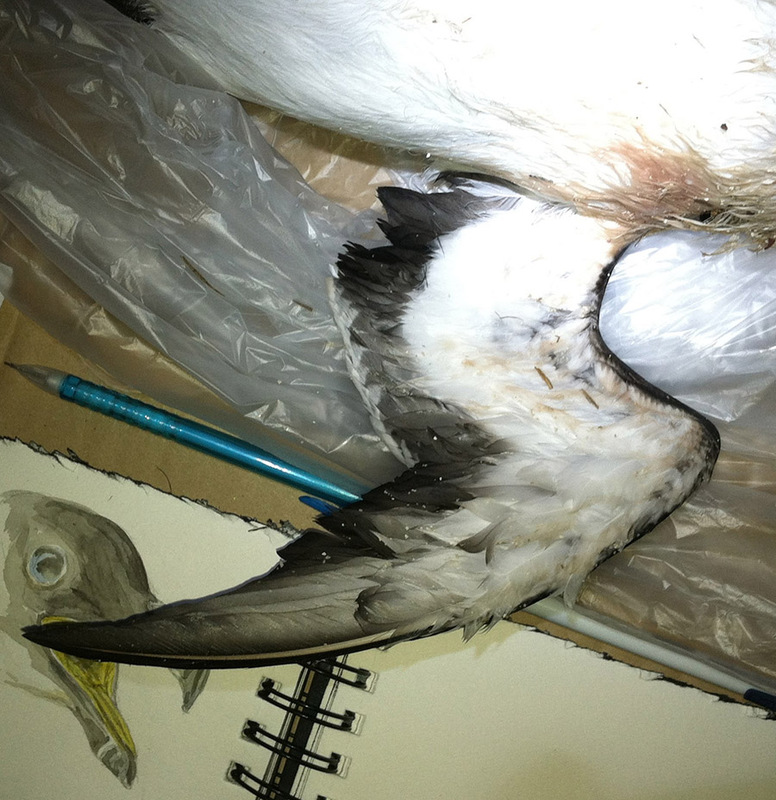 Rarely, old birds with two bands have been documented, but this may be associated with geographical tendencies. As Razorbills age and the bill becomes deeper, one proximal groove, and up to three grooves distal of the white band may develop. The ageing of Razorbills based on the development of their bills cannot be done with accuracy, in part because sexual maturity in the species may be attained anytime between the third and sixth year of life. Some birds may never develop more than a single distal groove their entire lifespan, and this may influence their success as breeders (De Wijs 1983). A 1988 study by Jones demonstrated through the trapping and measuring of breeding birds in the Palearctic that a small margin of birds (9%) had developed a third groove distal of the white band. Only birds past their third summer had more than two distal grooves. That study also showed a tendency for bill depth and wing length to increase with age. 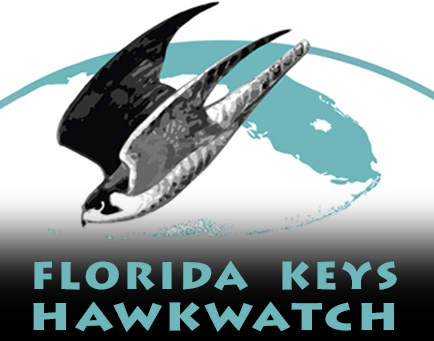 The impromptu situation during this Christmas Bird Count expedition to the Dry Tortugas (December 18-20, 2012) did not allow for the proper measuring of the found corpse, therefore it is hoped that a prepared specimen will supply future details. On the other hand, this might have been one of the only opportunities to examine the remarkable yellow buccal cavity of the bird, since internal tissue deterioration had likely commenced, and frozen birds may present challenges in this camp. In addition to ornamental bill parts, the Alcidae are also known for colorful mouth interiors, used during threat displays and courtship. These range from light blue in Ancient Murrelet (Synthliboramphus antiquus) to vermilion in guillemots (Cepphus), and are yellow-orange in breeding Razorbills. Additionally, their mouths and tongues are equipped with specialized projections and gripping accessories that allow for the trapping of slippery prey. During the breeding season, Razorbills may carry multiple fish from several fishing bouts crosswise on their bills. Prey such as capelin or sandlace are carried by breeding adults from the ocean back to nest sites on cliff ledges, and fed to the young. The Razorbill’s buccal organs are well adapted for continually foraging and catching prey while securely retaining earlier catches. After fish are caught, they are slipped back towards the gape with the aid of the smooth anterior end of the tongue. The fish are gripped tightly against the horny palate by projections on the posterior of the tongue. The knobbed and flexible inner lining of the mouth helps secure prey. In this manner, a Razorbill is able to repeatedly open its bill to continue foraging while as many as half a dozen fish remain in place. I found this freshly deceased Razorbill washed up on the southeastern-most shoreline of Garden Key, in Dry Tortugas National Park on the evening of December 18, the night before the annual Christmas Bird Count. During these occasions, our count team stays in the barracks of Fort Jefferson, which offer modest accommodations but no suitable work space. 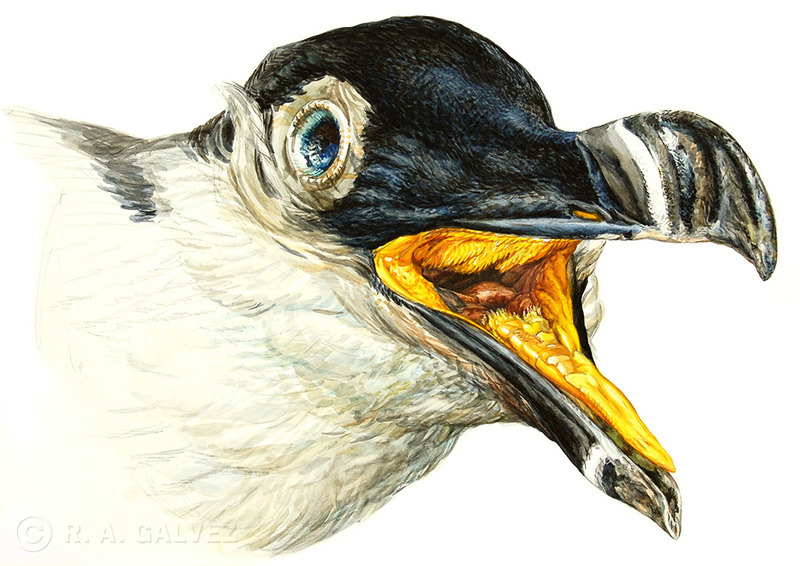 I spent much of that night awake, sketching this Razorbill under flashlights and my headlamp. The renderings of the bill and buccal cavity of this specimen were drafted from direct observation, aiming to depict proportionate relationships in the form and shapes of each organ. No calipers were used, nor was there an opportunity to make drawings based on measurements. The specimen was surrendered to the National Park Service and transported back to the mainland in the freezer of the NPS M/V Fort Jefferson vessel. I was informed that it would be taken to a research facility for preparation and possible eventual submission to the Florida Museum of Natural History at UF. Barrett, R.T., Ankier-Nilssen, T. & Krasnov, Y.V. 1997. Can Norwegian and Russian Razorbills Alca torda be identified by their measurements? Marine Ornithology 25: 5–8. Chapman, Frank M. 1966. Handbook of Birds, Eastern North America. Dover Publications, New York. De Wijs, W. J. R. 1983. Proposed ageing system for Common Guillemot and Razorbill. Nieuwsbrief Nederlands Stook. Omler. 16: 123-132. Feducia, Alan. 1999. The Origin and Evolution of Birds. Yale University Press, New Haven. Johnsgard, Paul A., “Diving Birds of North America: Species Accounts — Auks (Alcidae)” (1987). Diving Birds of North America, by Paul Johnsgard. Paper 11. Jones, P. Hope (1988): Post‐fledging wing and bill development in the Razorbill Alca torda islandica, Ringing & Migration, 9:1, 11-17. Lavers, J.L., I.L. Jones and A.W. Diamond. 2008. Age at First Return and Breeding of Razorbills (Alca torda) on the Gannet Islands, Labrador and Machias Seal Island, New Brunswick. Waterbirds 31(1): 30-34, 2008. Lloyd, C. S. and C. M. Perrins. 1977. Survival and age at first breeding in the Razorbill. Bird-Banding 48: 239-252. Lofgren, Lars. 1987. Ocean Birds. Crescent Books, New York. Proctor, Noble S. and Pratrick J. Lynch. Manual of Ornithology. Avian Structure & Function. Yale University Press, New Haven. Pyle, P. 2008. Identification guide to North American birds. Part II: Anatidae to Alcidae. Slate Creek Press, Point Reyes Station, CA. Welty, Joel C. and Luis Baptista. 1988. The Life of Birds. Fourth Edition. Saunders College Publishing, New York.